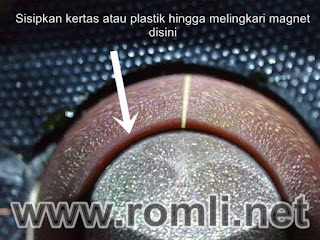 This article, we will try to discuss on how to fix broken speakers which is marked with a raspy voice. With notes, the speaker spool does not break!. As I have discussed in other articles, on how to find out which speakers are broken. Also read: How to test if the speaker is damaged or not. To make sure that the speakers have been damaged is by tapping the leaf of the speakers inside. When you hear a friction when you press it, then the speakers have been damaged and will sound hoarse because the sound is mixed with the friction earlier. Furthermore, the simple way to fix it is by rearranging the speaker spool position to get back into position (right in the center of the magnet). Paper or plastic to prop it up (not too thick). Gasoline or other liquids (used to soften the glue). If the speakers that we will fix is a speaker with a wider diameter, then the easiest way is by unpacking the spool. Drop the gasoline on the glue that surrounds the speaker's spool with the speaker leaf, do until the glue is completely softened. But first mark the position of the speaker spool depth so that the sound does not change. After the speaker spool like being released, insert paper or plastic on the sidelines between the spool and the central magnet and do by not changing the position of the speaker's spool depth. Then give glue again on the former glue that has been removed earlier. Allow until the glue is completely dry. After the glue is dry, release (pull out) paper or plastic that we insert on the sidelines of the magnet earlier. Try pressing the speaker leaf and listen, Are there no more friction noises? If there is no sound of friction, glue back the dust cap. Now the speakers are ready for use. Also read: Causes of speaker damageAnd for speakers with small diameter, e.g. satellite speakers. The easy way is by releasing the leaf edge of the speaker (suspension surrounds). Don't forget to remove the dust cap first. 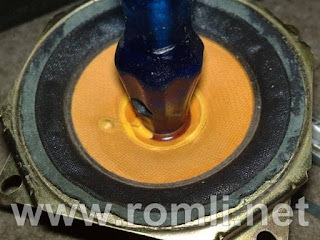 Then remove the glue attached to the edge of the speaker, use gasoline to soften it. After they surround is released (make sure it is completely detached) then give the glue again as before. Then press the speaker spool until it stops (use the base of the screwdriver handle, as shown). Then glue back the surround without releasing our hands that suppress the spool. Press and hold until the surround is really attach. 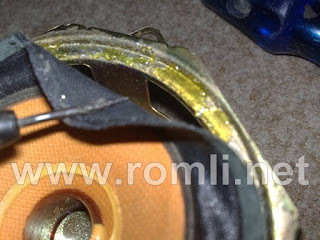 Once felt to have been attached evenly, release pressure on speaker spool. Up to this point, Spool speakers are already in the center position. Then reattach the dust cap. Well.. the speaker has been healed.